Do you really not like people? I mean, can’t stand to be around other human beings at all because, just no. Well, technology has come up with a solution for you. The Chameleonmask is like the Uber for people, hire someone to stream your face and live your life. 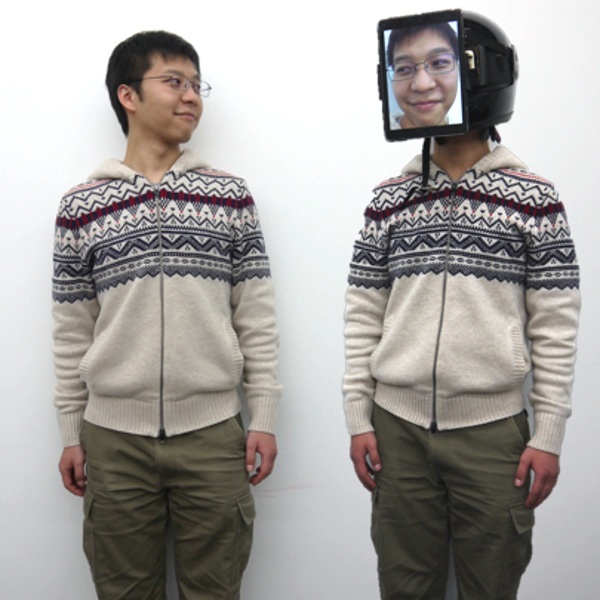 This mask is a tablet attached to a helmet, hiding the human’s face. The tablet streams the . . . users face instead. The person wearing the mask, the host I guess, mimics the user by following their directions. This allows the person to be present without, well, being present. Even though this sounds like it would be creepy, it doesn’t seem to bother most people. It might be an solution for being present at family events that you can’t travel to or work functions. A few years ago we saw a similar concept that used tablet on top of a Segway type device. This is probably less expensive. You can’t take the Chameleonmask for a spin yet but keep an eye on the project if you dream of a future where you never have to leave home again.